Typical Plains Indians, friends of Cheyenne, Arapaho bravely fought alongside the Sioux and Cheyenne to protect their territories. The Northern Arapaho share with the Shoshone Wind River Reservation and south live in western Oklahoma alongside the Cheyennes. Arapaho Plains Indians are, although they settled there at the end of the seventeenth century, probably from northern Great Lakes. They migrate along the Cheyenne with which they have, since time immemorial, forged a very close friendship. Arapaho and Cheyenne are with the Blackfeet, Algonquin-speaking peoples who have advanced furthest to the west. The word "Arapaho" is perhaps Caddoan origin, meaning "merchants". The Lakota call them "Blue Sky" and Cheyennes "People of the Clouds". They call themselves "Inuna-Ina" (People of our Relationship). While the Cheyenne move towards the Black Hills, Arapaho reach the upper valley of the Missouri. Those who are most distant north are known under the name Gros Ventre or Atsina. Although they allied with the Blackfeet, Gros Ventre are still regarded by the Arapaho as part of their nation. Arapaho themselves settled in southern Montana and Wyoming where they live and fight alongside their friends Cheyenne. Then they combine the Lakota who around 1750 to 1760, drove the Black Hills region Crow, Shoshone and Kiowa. The main enemies of Arapaho are now the Utes and Shoshones. Less belligerent than the Cheyenne, Arapaho have a contemplative nature, inclined towards spirituality. Their ritual of the Sun Dance is the most complex of all the Plains Indians and the tortures inflicted volunteers that the dancers are among the hardest. Unlike the Cheyenne, Arapaho Sun Dance is held open around the Sacred Tree, such as the Lakota. 1830, the Arapaho Nation splits into two. A large group away to the south in the company of some of the Cheyennes, reaching the Platte River and the Arkansas and Colorado. They face a moment the Kiowas and Comanches, then make peace with them in 1840. Arapaho and Cheyenne often join raids made by Comanches and Kiowas in northern Texas and into Mexico. Northern Arapaho involved in war with Red Cloud Lakota and Northern Cheyenne to avenge the atrocities of Sand Creek and defend their hunting grounds invaded by settlers. August 28, 1865 at Wolf Creek, near the Tongue River, the camp of Chief Black Bear is attacked and destroyed by the troops of General Patrick E. Connor engaged in the Powder River Expedition. Dozens of men, women and children are killed. In 1867, the Treaty of Medicine Lodge, South Arapaho agree to withdraw a reservation Indian Territory they share with the Cheyennes. November 27, 1868, Arapaho come to the rescue camp Cheyenne Black Kettle on the Washita River attacked by Lieutenant Colonel George A. Custer of the reserve. The majority of South Arapaho participate in the War of the Red River that lead Cheyennes in 1874-1875 with the Comanches and Kiowas. South Arapaho need in 1890 to accept the sharing of private property provided they deal with the Cheyenne in Oklahoma. Land "surplus" by the state sold to settlers, as required by the Dawes Act. In 1896, the anthropologist James Mooney describes the Arapaho in these terms: "They are more docile than are generally the Plains Indians and they now accepted as inevitable civilization ...". 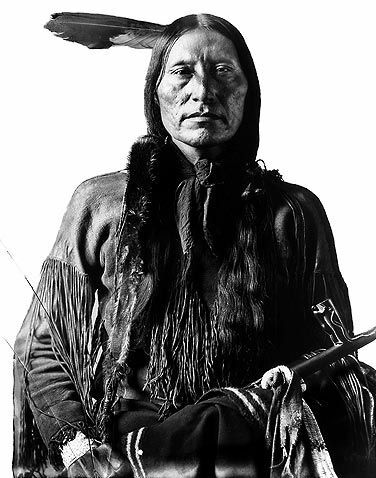 However, under the influence of the prophet Arapaho Sitting Bull, which should not be confused with the famous chief Hunkpapas, Arapaho were among the most active in the movement of the Dance of the Spirits that they abandon 1893, proving that they were not as docile and resigned that anthropologists had thought.